We Excel in Commercial Building and Renovations in Mooresville and Lake Norman, NC. 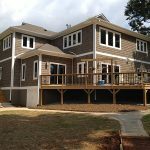 Commercial Building and Renovations in Mooresville & Lake Norman – Chad Goodin Signature Homes is more than just a residential renovations company; we are also expert contractors in the commercial building arena. As one of Lake Norman and Mooresville, North Carolina’s premier contracting companies, we excel in commercial building and renovations for businesses. As professional general contractors, we believe we can take your commercial space to the next level! With our commercial building and renovation services, we ensure that your commercial remodeling fits your brand. We make sure that you are involved every step of the way to guarantee that your remodeling design is cohesive with your business and brand. In addition, we can do all kinds of custom work to give you the business space you and your employees have always wanted. At Chad Goodin Signature Homes, we understand how important it is for your business to stand out and differentiate itself from your competitors. Call us today to see how we can create a beautiful custom work space that is perfect for your business! At Chad Goodin Signature Homes, we perform high-quality commercial renovations in Mooresville, Cornelius, Davidson, Huntersville and the surrounding Lake Norman area of North Carolina.